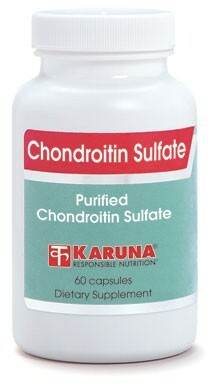 Chondroitin sulfate is a glycosaminoglycan (GAG) that is a critical constituent of the ground substance of connective tissue, which creates a gelatin-like matrix that holds and nourishes protein fibers, and helps provide shape, lubrication and shock absorption to bone, cartilage, intervertebral disc material, and synovial fluid. Bovine tracheal cartilage is a common source for supplemental chondroitin sulfate (CS), which may supply important precursors for resynthesis of disrupted or decomposed connective tissue structures. Both intact CS consumed orally as well as additionally absorbed digestive breakdown products may account for the consistent benefit demonstrated in studies of joint health, including evidence of chondroprotection. This single ingredient product offers flexibility when combined with other cartilage support solutions. Suggested use for adults: One capsule two times a day, or as directed.